Like the old song says, with alpacas, to know them is to love them! 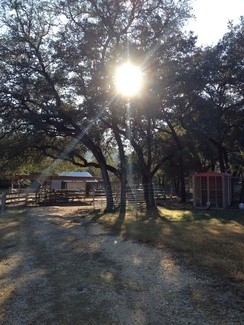 We have never had a ranch visitor that left our ranch not wishing they could take some home. That being said, taking home livestock means accepting some degree of work and expense, and potential new owners always have a lot of questions. We are always ready to answer. One of the most common questions asked about alpacas is “What do you do with them?”, and the corollary, “How can you make money doing this?”. Throughout the livestock industry, profits are made either by slaughtering the animal and selling products (meat, etc), by obtaining products from a live animal (eggs, milk, wool, etc), or by selling the offspring. The ultimate value of alpacas is in their unusually fine fleece, but there is also significant return on investment with selling offspring. 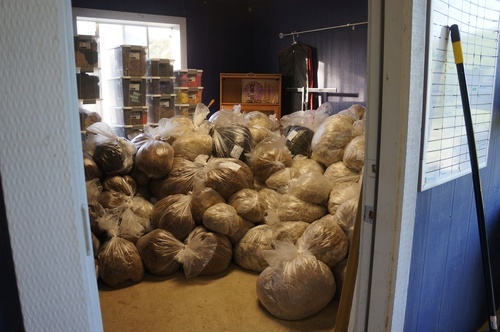 The fleece is collected once a year, by shearing, which does not harm the alpaca in any way. 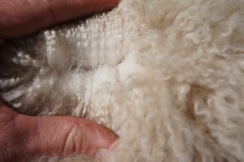 Fleece weights vary from three to thirteen pounds. Depending on the quality of the fleece, it can be sold raw for $2-8 per pound, which admittedly covers only a few expenses in a small herd. 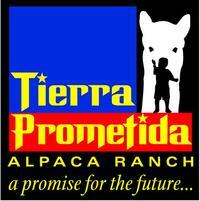 Larger farms, some with 2000 alpacas or more, find the raw fiber to be profitable. However, smaller alpaca ranchers have learned how to multiply the value of the fiber by processing it into yarn, which usually sells for $40 a pound. There are nearby craftsmen that utilize the coarser parts of the fleece to make beautiful rugs with natural colors that are perfect with a Southwestern décor. The fiber succeeds because it is unequaled in softness, comfort, and durability and the demand is high. Alpaca can be worn next to the skin by the same people who become itchy wearing sheep’s wool. Fleece production is the sustainable way for alpacas to pay their own way. However, some ranchers concentrate on the breeding side of the industry. Not every alpaca is breeding quality, but those that are command an enviable return on investment at auction. In the past, the prices were often unjustifiably high, and sometimes still are. Today, quality breeding alpacas will often be sold at auction for several thousand dollars. However, there is also a market for very nice alpacas, for pets or just for fiber producers, which are available at a fraction of that cost. The economy, and the increasing sophistication of buyers, has brought the prices down to the point that alpaca ownership is within reach for many land owners. Winter is a good time to be an alpaca. Finally some relief from the heat, and the alpacas could not be happier! They are in full fleece with only a month before show season, and only four months before shearing time. They are energized by the cold. While the moms watch, the excited babies run laps around the pastures, kind of their version of alpaca NASCAR. On a day so icy that the humans just huddle inside, the alpacas are practically bouncing in the pasture. They are made for this season. Their advantage over the cold is, of course, their wonderful fleece which they will be happy to share with us come springtime. Fortunately we have last year’s fleece that we can use now. In Texas, winter is the time for babies! Anywhere that winters get cruelly cold, like the alpaca’s native Altiplano in South America, babies (“cria”) are born in the summer. Here, our summers are too hot for an alpaca mom, a “dam”, to be at term with a pregnancy, but winter here is perfect. 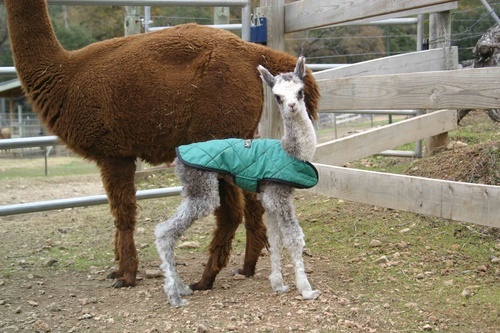 Alpaca ranchers need to be observant because a wet newborn cria can get dangerously hypothermic if not assisted, dried, and warmed up, but alpacas have evolved the tendency to have cria between dawn and noon to take advantage of the sun. This makes life a lot easier for us. If night is falling and it looks like a dam is going to have a cria, we can put her in the barn and we may find a warm, dry baby in the morning. Cria usually weigh from 14 to 20 pounds at birth and may gain up to a pound a day for the first month, all from nursing. It is important for the alpaca rancher to watch the newborn cria a make sure they are “figuring out” how to nurse and are “latching on”. Once they do so, they will generally be just fine. Alpaca dams are very attentive moms, but the cria have the protection of the whole herd and all the other moms. 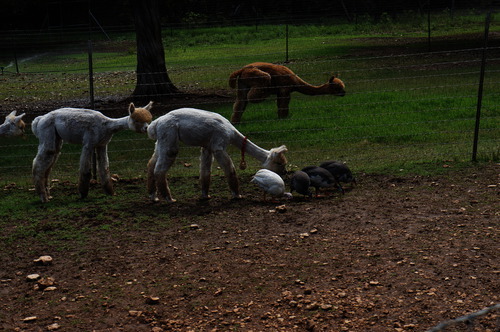 Some dams will even allow cria to nurse that are not their own. Some cria get pretty chubby this way but they usually burn it off at the races. Cria are a lot of fun, naturally trusting and curious, and the dams trust their human friends around the cria. Winter is a good time to be an alpaca rancher, too. Last month, Rhonda wrote an article about her favorite charitable cause, the Quechua Benefit. As I write this December article, it is still November, and she is still in Peru, where spring is coming. Rhonda is the medical director for a crew of providers that are caring for the Quechua natives of Peru who live high in the Andes, often above 15,000 feet. This medical team goes once a year, helping as they can with the resources available, and trying to make a difference in the lives of the Quechua. Today they took shoes that The Benefit purchased from donations, and delivered them to children who are walking around the Andes with rags on their feel. Rhonda says that there were many adorable little girls that felt like Cinderella when they got their shoes. Makes me a little ashamed of all the pairs of shoes I have thrown away because of minor wear. They also deliver sunscreen (the sun is pretty intense at that altitude), eyeglasses so people can read their Bibles or thread a needle, whatever nutrition they can find, and, of course, free medical care to people who have often never had any at all. I know The Quechua Benefit spends every dime on the people who need it. Even the doctors, nurses, and workers who travel to Peru to help are paying their own way. I should be able to claim that Rhonda’s being away is tough on me, too, and that I have to do all the work! 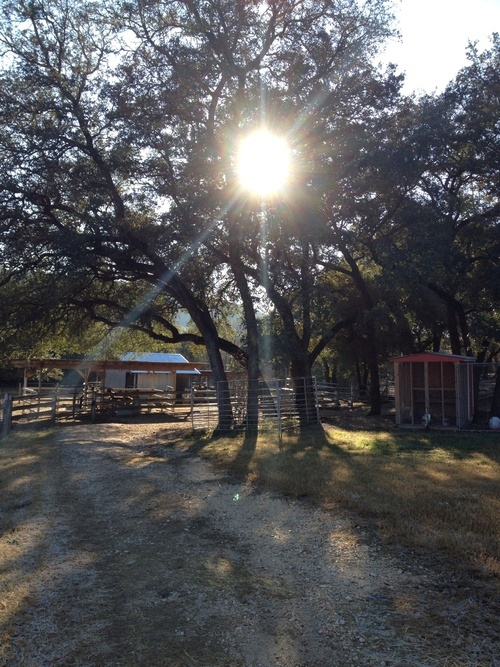 However, our ranch manager, Jenny Thompson, is really the hero at home when Rhonda is away. Jenny works a lot anyway, but almost nonstop since the mission trips started. Jenny took the show alpacas to Kansas City, and then Oklahoma City, and came home with an abundance of blue ribbons and championships. One little male, Athos, won a blue ribbon, best crimp ribbon, color championship ribbon, and best-of-show award for his fleece. And he is from last year’s crop of cria! This year’s is looking even better. Good job, Jenny! Speaking of cria, December promises to give us a bumper crop of new and beautiful babies. The alpacas are all putting on thick fleeces again and the cria are being born every week. If you want to see babies, this month is a great time to come by for a visit. It’s free, and, if they are in the mood, you may get a really great picture of an alpaca baby kissing you for your Christmas letter! Just let us know if you are coming by! In December, our alpaca moms delivered to us some of the best babies we have ever had. Rhonda’s careful attention to breeding, health, and nutrition in our alpacas has led to a cria crop that should do spectacularly well in next year’s shows. With the colder weather, the alpacas are their most active and happy. The babies get together and have pronking races around the pastures. It’s hilarious to watch. Some of these babies are healthy and beautiful, but will not be up to Rhonda’s exacting breeding standards. They will still be great sources of fleece, and eventually make great pets for someone. We have been selling more alpacas for pets every year as our breeding standards have tightened and people begin to realize how great alpacas can be as inexpensive pets. January is always a sobering month. The lights come down, the parties end, and the family goes home, or back to school. It’s too cold to go to the lake. The consequences of all the buffets show up on the bathroom scales, and the credit card bills arrive. Plus, as I write this, we are possibly facing “the fiscal cliff”. In December, we had holidays, festivities, and hopes for peace on earth. In January, we have . . . resolutions! I suggest a treatment for the January doldrums; make a donation to your favorite charity! Charity beneficiaries don’t stop having needs just because the season is over. Go ahead! Give up the latte, or the dinner out, or something else, for a month (it will help with the holiday weight gain anyways), and donate that money to a charity near to your heart. We donate to our church, a Native American school in South Dakota (the Native Americans need some pay backs), a charity that helps wounded veterans and their families, Heifer International which will put livestock (including alpacas!) in the hands of the people who need them the most, and the Quechua Benefit which is providing vital food, housing, and health services to some of the poorest people in the world. There are many other charities doing great work and using every donation wisely. Making a donation reminds us of just how many of our “necessities” are really options. It is heartwarming in a cold month to put a check in the mail for people who really need the help. The alpacas send their New Years greetings! Another treatment for the January blues would be to come visit them! They are really cute right now! I guess I just don't get it. Why would anyone take the time to write down their random thoughts for no one in particular. No one may ever even read what you write...so why bother? Is it the whole process of letting of steam and venting? Or is it like talking to yourself...except in ink? And if so...do you really want just anyone reading it? Hmmm. I can understand keeping a journal; I just wouldn't want to share it with everyone. Maybe it is an effective release for those individuals that are frustrated writers. They don't really need an audience, but they wouldn't mind having one. Not much of a winter this year. I am going to have left-over kerosene that the greenhouse didn’t need. The fire ants are already figuring out that the winter was short, warm, and damp. At least I don’t fret over the dandelions out here on the ranch. Actually, I kind of admire the fact that they are early risers, up and at ‘em. Our ranch is the “early riser” for the most intense season in the alpaca world, the shearing season. Yup, like the wave of bluebonnets will start in South Texas and move north, the nations alpaca shearing starts right here, at the first of April, and moves north into Canada by July. I have heard that grain farmers will harvest 20 hours a day, long into the night, when the crops are coming in. We aren’t quite that furious, but shearing days are noisy, dusty celebrations that are a year in the making. It’s like opening a present every time the shearer makes the first few rows and the glorious fleece reveals the shine and softness just underneath the crust of accumulated Texas dust. We usually have to coax the workers to get back to their jobs because it is so eye-catching just to see these blankets of fleece roll off. On a particularly fine alpaca, the New Zealander that does our shearing will yell, in his kiwi accent, “This one is [bleep]! May as well give this one to the shearer!”. He shears thousands of alpacas a year, so that is a major compliment. The alpacas seem to like it, too. Oh, the first time at shearing they are kind of scared with all these humans crowded around, but they feel so cool afterwards. Usually the first one shorn and returned to the pen gets the “Hey, dude, look what they did to you!” attitude from the others, but before long they have all gone from puffy Ewoks to stick animals. So much fiber on such a tiny frame! Here is the important part. 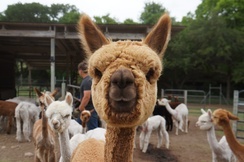 If you want to see alpacas in full fleece, we are having a FARM OPEN HOUSE on SATURDAY, MARCH 24th, from 10 AM to 5 PM! Yes, that’s right! You can hug them all you want at their full fluffiness. We shear March 30th and 31st if you want to get dirty! But mark your calendar for MARCH 24th. I am sitting at the auction hall at the South Point Casino in Las Vegas and some of our alpacas will soon be going on the auction block. Elvis is on stage showing an alpaca right now and he is doing pretty darn well! Las Vegas has colored lights everywhere. 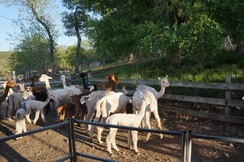 Earlier today, previewing the alpacas to be auctioned also reveals every color that alpacas may show. White, black, grey, “rose” grey and every shade of brown. This is color that goes through the fiber, to the core, and is a natural, dye-free color that won’t fade. There is no color that is “better” and it is the other fiber characteristics, traits that breeders want in their programs, really drive these auctions. Good alpaca fiber is smooth, cool, bouncy, and shines beautifully. Alpaca fiber is refreshingly “non-scratchy”. This is science, not just opinion. The electron microscope shows why alpaca fiber feels good close to the skin; the hair cells are layered on the surface of the hair shaft and there are no jagged edges as are seen in the hair of sheep, and humans for that matter. Furthermore, the alpaca fibers are tiny in diameter, only 15-25 microns, as opposed to most wool which is 35-50 microns, and human hair which is 50-70 microns. This makes a fiber so soft that people gasp the first time the feel it. These auction alpacas are packing 7-10 pounds of fiber each. Wow! These alpacas are selling for high-four figures! Now I am really optimistic! It’s noisy with auctioneers chattering, spotters barking bids, and the phones ringing. Of course, any of these particular alpacas could be a champion. 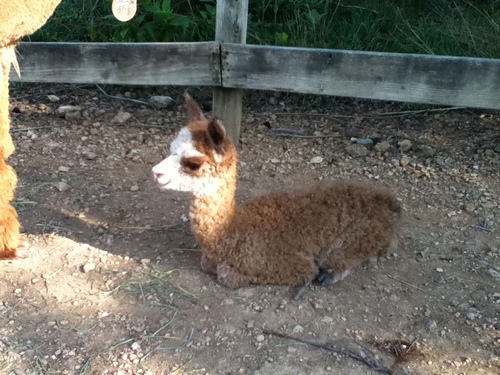 There are a lot of excellent alpacas back home in Texas that are much, much less expensive. Many great fleeces are found on alpacas that are otherwise not put in shows because of relatively small flaws, like a white spot on the nose of a black alpaca. That does not hurt the fleece but that little spot keeps them out of the show ring. We’re up! Here we go. First bid immediately blew past our minimum price. Cool! C’mon, c’mon! Up we go some more. Ok, now we’re stalled, but the auctioneer is telling the crowd about her show wins. Maybe I should have worn an Elvis costume. Heart thumping, bid, counterbid, another counterbid. Good, good, keep it up! Sweaty palms. The bidders are talking on the cell phone, probably to their accountants. Great, green light, a higher bid still! But table 12, not to be beat, closes the deal at three times our minimum. That’s it, all done, sold! Yeehaw, I love Las Vegas! We are on the to the Futurity in Grand Island Nebraska! Yesterday we left at about 9am and headed due north on I-35. On board, we have Jenny Thompson, my trusty ranch manager and friend, Harriet Neubauer, a friend and relatively new alpaca breeder, myself....and TP Poseidon's Gladiator, TP Poseidon's Isaac's Journey, TP Poseidon's Isaac's U2, Tierra's XXXSTACy, TP Poseidon's Elin, TP Poseion's Rose, Matrix Serenity, Snowmass Winter Kiss, and Matrix Serentiy's Scarlet. We have high hopes of course....but get real...it is the FUTURITY! Oh and of course...as soon as we left, one of our girls who was 3 weeks overdue delivered her ATV Adonnis cria.....a gorgeous rose gray boy that I can't wait to get my hands on!! I need a macho name for him. Any ideas? Our first stop yesterday was at Michelle AuClaire's farm near Arbuckle, OK. We turned left off of I35 on hwy 7 just as it started hailing and the freeway shut down! Thank God for divine intervention! We dropped off 56 of our retired show fleeces to be sent to the Alpaca Blanket Project in Oregon. (MIchelle's place is a collection site). We turned around and got back on the freeway and headed north again and all the storms had thankfully moved east! We stopped in Newton, Kansas for the night and had a delightful dinner at the local Applebee's and met the new owners of TP Poseidon's Isaac's Rachel who came and picked her up at the Applebee's parking lot. (I think Rachel was glad to be able to get out of the trailer for a while! She probably was hoping that Applebee's served Orchardgrass Hay!). After the alpaca exchange, we went to our hotel and got a good night's sleep. We are probably getting 5 miles per gallon today driving into a steady 25-30mph wind with gusts up to 40 and 50 predicted....hmm. It is supposed to be snowing in Grand Island, according to radar...I guess we will find out in about 2 hours! Wish us luck. XXXSTACY is in the Auction on Saturday, April 16 and is a beautiful dark brown female who I hope finds an apprectiative new owner....sometimes I feel like I'm selling my children! The End of March already? Really? Wow! This year seems to be zipping by! We are shearing starting tomorrow and by Saturday should be done and everyone will be shorn except for our show string. I can't wait to get my hands into all of those TP Poseidon's Motivator's babies fleeces! Too bad that they won't be old enough to show until fall...I can't wait. We will be heading off to the Futurity in a couple of weeks and then The Great Western Show and Nationals. Then my son Mark will be graduating from High School. We have a busy few months ahead of us.